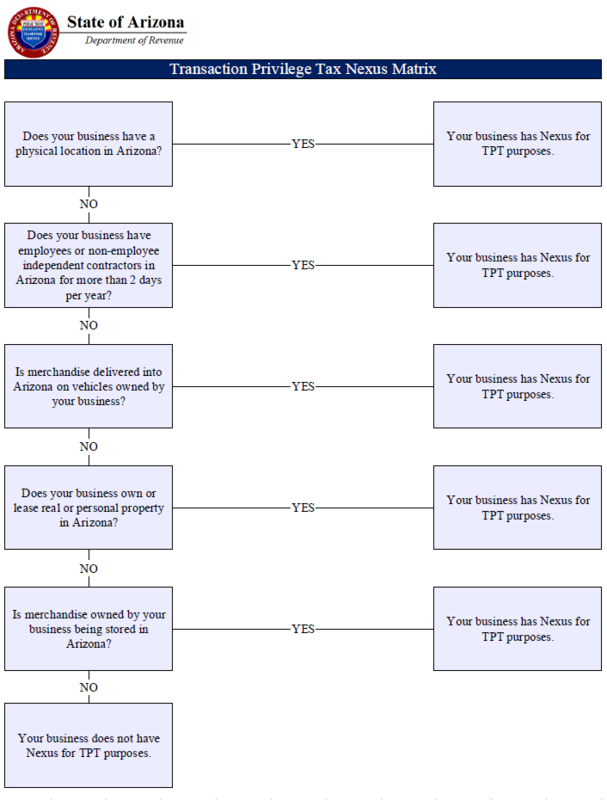 Although commonly referred to as a sales tax, the Arizona transaction privilege tax (TPT) is actually a tax on a vendor for the privilege of doing business in the state. It is measured by the value of tangible personal property (TPP) sold by the vendor in Arizona. The vendor is liable for the tax, even though the vendor may pass on the tax to the consumer. Use tax, which is a tax on any TPP bought from an out-of-state vendor that is stored, used or consumed in Arizona, and no tax was paid to the state of sale. The consumer is liable for use tax if TPP was purchased with no tax paid to the state of sale. If there is no nexus with the state, a vendor may collect use tax for the convenience of the customer. For additional information, please refer to the Transaction Privilege Rulings (TPR) 16-1 and TPR 16-3. Additional guidance for making a self-determination of nexus for TPT purposes.